Sunrise, Sunset, poplar and acrylic paint, 255mm (1oin) high x 510mm (20in) dia. Carole Floate is a well-respected name on the international turning scene and you only have to take a look at her exquisite sculptural forms to see why. I had the opportunity to put this profile together with her help and in the process, also had the opportunity to find out more about the influences behind these forms as well as how she discovered woodturning. Carole begins by telling me how she has been turning wood since the mid- 1990s: "I got hooked on woodturning when my husband signed me up for an all-day demo with John Jordan, and that was around 16 years ago. When I saw those ribbons of wood flying through the air and piling up on the floor, I knew I had to continue to turn after the class finished." Carole tells me that for as long as she can remember, she has loved working with wood, and likens the beauty and fragrance of the different woods to Christmas time. "Every time a piece is turne" she comments. 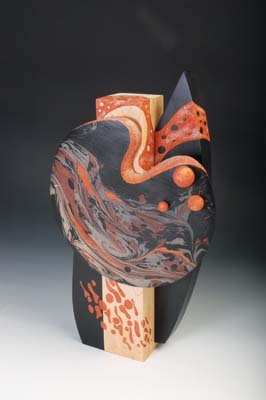 of being able to devote all of her time to woodturning, which is a dream come true for her. Once Carole's course with John was over, she decided to buy herself a lathe, which she still owns, and began experimenting with many of the techniques and skills that she learnt. Carole tells me that even from the beginning of her turning career, she always looked for pieces of wood that had natural features - she was excited to see them as the piece was turned. How would the form develop; What did the wood look like as it was turned; How do the natural features change as a result of the turning process? Carole tells me that today, many of her pieces are embellished although many of the natural features of the wood - bark inclusions, spalting, burls - are still present, so in a sense, there is a strong interplay between added effects and naturally occurring elements, which seems to be a winning combination for Carole. "When I originally started out turning, the work I produced was quite utilitarian in that I was primarily producing bowls, platters and vessels. 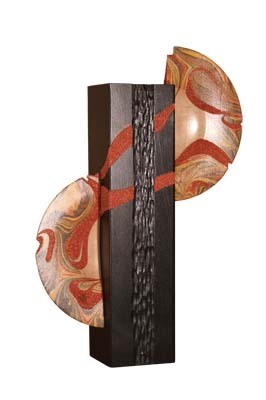 However, today I am creating sculptural pieces that incorporate turned elements that are then marbled, stippled, painted or textured." When you look at how Carole has perfected these techniques, you could say that her work has moved on leaps and bounds from the ubiquitous bowl or platter that she started out producing. She is an inspiration for us all. 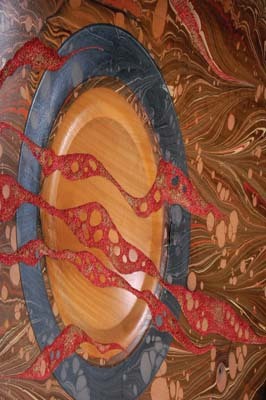 "I found it so fascinating to manipulate the colours in ways that enhanced the wood. But a lot of my pieces start out being painted with a dark or black background that then becomes the canvas for the marbling." as well as deep sea, and the harmony of movement and plants. I had begun to realise that Carole has a very fertile mind, one where a person can look at a piece of wood and imagine it painted and textured using myriad colours and techniques to make it visually stunning. Not every turner has this skill, and many choose to leave their work natural, but for Carole, she longs to push the boundaries of turned art: "It is mainly good shapes and design, colour, the use of natural wood and creativity that inspires me. One day, I would very much like to have my work displayed in the Smithsonian Institute," she tells me. Carole describes her work as becoming more structural and is now definitely more contemporary and artistic than her work used to be. In this sense, she has moved forward and embraced the inspirational sources that are available to her, to magnificent effect. As well as discovering her inspirational sources, I was also intrigued to find out which turners, or people, Carole looks to in terms of artistic influence: "My husband was my first and greatest influence; he supported me in whatever I did with woodturning. He was my mentor and kept me going forward. Today, the persons who influence me are, to name just a few: Binh Pho, J. Paul Fennell, John Jordan and many other great turners. Most of them have been in my home and they have always encouraged me to keep moving forward," she finishes. Unsurprisingly Carole has won many awards for her fantastic work at juried shows and art fairs, winning 'best on show' and 'best of media' on numerous occasions. 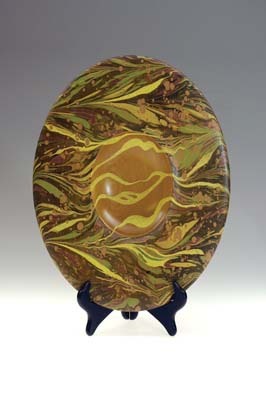 She is also a member of many woodturning clubs such as those in Chicago and Wisconsin, USA. She also explains how she actively participates in various regular demonstrations, where she shares her techniques for embellishing her work. 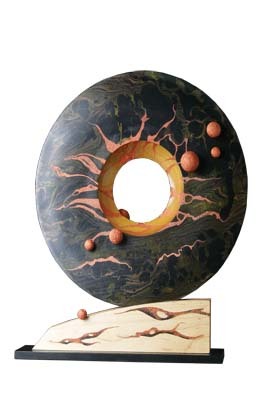 "I undertake club demos on both turning and marbling, and I teach woodturning at the local Woodcraft stores. I am involved in over 10 galleries located in the Chicagoland area, Indiana, Wisconsin and Michigan, and am also involved with many organisations." Carole also describes how she is currently a board member of many guilds, galleries, and also does individual tutoring in woodturning. No wonder she is busy! I am always interested to see and hear about the creative spaces in which these turners make their pieces, so I asked Carole about how her workspace has changed since she first started turning, and also how she makes her forms come together. She begins by telling me about her old workshop which, according to Carole, was rather small and only had one lathe, a grinder, drill press and a small bandsaw. However, now she has much more space: "I now have a workshop in the lower level of my home that was an addition just for the workshop. There is about 2000sq. feet of workspace. I have a Woodfast - the first lathe we bought - a Oneway 2436 and I also have three other small mini Jet lathes set up. I also have two bandsaws - one smaller and the other a resaw. There's also three belt sanders, a 60-gallon air compressor and lots more. My husband was a tool guy and made sure I had whatever I needed," Carole explains. Throughout the interview, Carole reinforces the fact that her ultimate goal is to get her work into high-end galleries, and that is what she is currently concentrating her energies on. In my opinion, her work is definitely of a high enough calibre to enable her to do this, so I'm sure her dreams will be realised very soon. She explains that she has displayed her work in many summer art shows over the past 16 years, but she now wants to focus on galleries and invitational showings. "I hope to get my work into more prominent galleries that can promote my work on a higher level than smaller, local galleries." In terms of the highs and lows of her career so far, Carole cites the highs involved when receiving praise and compliments about her work from people and other turners who are present at the SOFA (Sculpture Objects & Functional Art) event each year. However, she tells me that she has received quite a few set-backs and lows in terms of persevering to get her work into the high-end galleries. She also explains how she does struggle to come up with new and unique ideas for her work, as I'm sure many turners out there do. 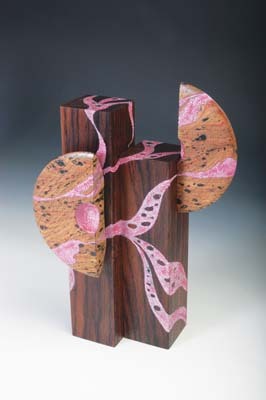 "Now that I have been marbling the turned wood pieces and then embellishing the marbled pattern on the wood, I am now moving into creating more sculptural pieces." It sounds like Carole has found her niche, and it is also reassuring to learn that she is finally succeeding to get her work into the prestigious galleries where work such as hers belongs. 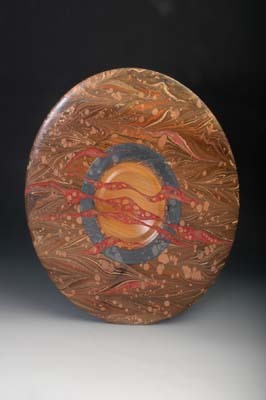 In terms of promotional sources, Carole explains how she attends most of the larger symposiums and displays her work there: "I also do demonstrations of marbling on wood which creates a lot of attention and interest. I have a website started, but it still needs some work. I have created several brochures for my work and use them whenever possible. Word of mouth is good as well. Many of my customers are always putting me in touch with new buyers for my work." It sounds to me as though Carole's future in terms of her turning is already pretty mapped out: she has a grand plan and she is already very successful both in the USA and on an international scale, as well as being well respected by her woodturning peers and customers. As before, Carole reiterates her future plan for getting her work displayed by many esteemed and celebrated galleries and becoming well known in this field. I wish her every success and I am positive that she will succeed. demonstrating and displaying her work over the coming months. See below for details.